Laiki Geitonia is a traditional neighbourhood inside the city walls. 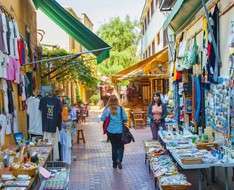 A stroll in this pedestrianised area gives the perfect insight into life in the Lefkosia of yesterday with its buildings that date from the 18th century and its narrow winding streets lined with little shops and craft workshops. Exhibition - presentation - offer of Cyprus olives, olive oil and derivatives. The art of “Lefkaritiko”embroidery taught by Mrs Maria, a hand embroidery expert from Lefkara village. Join us as we make the traditional Cypriot “Pasteli”, healthy nutritious bars made from caramelised carob syrup or honey and nuts. Presentation and preparation of Bourekia (a traditional type of pastry).